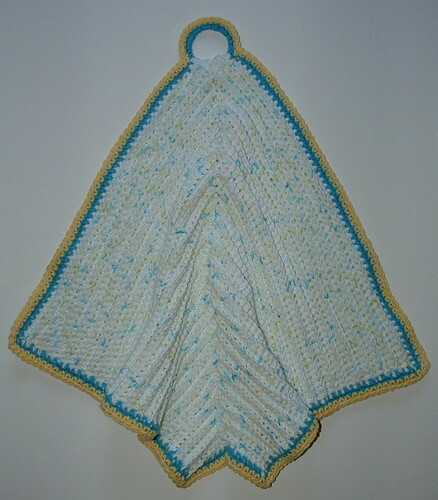 I present my diagonal cotton dish towel that I crocheted that features a ring as a hanger. 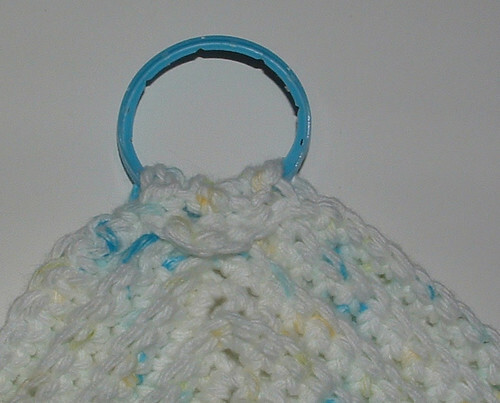 I love using the round recycled rings as I can hang up my towel over any hook or knob in the kitchen. 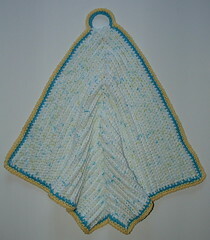 I crocheted one kitchen towel using regular weight cotton and another using sport weight cotton below. Sport weight cotton hanging towel. Measurements: 17 inches long from top to bottom corner and 19 inches wide from tip to tip. Working in BLO, Sc down to the center, work 3 Sc in center st, Sc in ea remaining st of tow. Ch 1, turn. With right side facing (R/S) and still working in BLO, Sc in ea st up near the top. Turn under top edge over the milk jug ring to the backside. Sl St across the front side edge to secure the ring in place, then working in BLO, Sc down the other side to the end. FO main color of cotton. Closeup of how the flap holds the ring in place. Back side shown here with the flap folded over the ring and stitched in place. 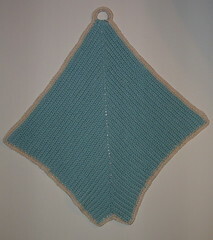 With R/S facing, attach blue yarn at right corner, Ch 1. Working in both loops now, Sc in in ea st up to the top, Sc evenly around the ring and continue down with a Sc in ea st on the other side. Work 2 Sc in corners and continue along the bottom edge by working Sc evenly along the edge back to the beginning. Join with a Sl St into beg Ch-1. 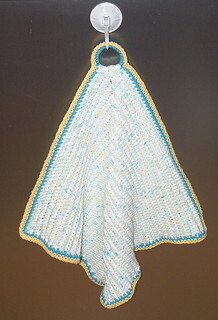 With R/S facing, attach yellow yarn at same right side corner and repeat row 37 using the yellow yarn for the final trim. FO. Follow pattern above for 64 rows using the sport yarn and then use 1/2 oz of contrasting yarn for trim.